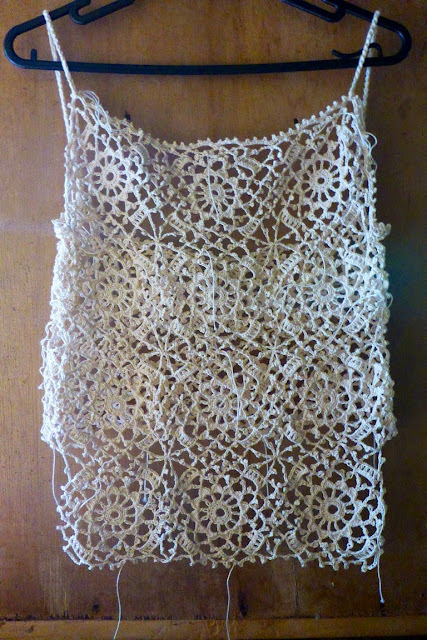 I have been meaning to make a dress with the Bebe Irish Crochet motif but have made only a shrug with the motif. This time, I finally managed to make a dress. The hardest part of making a dress with a motif is choosing the right motif. In this case, I selected a bebe motif without the Irish rose in the center. I also made this motif smaller by working only until round 7 of the 9 rounds of the motif. I modified the corner picot-loops at round 7 so that it can be joined to other motifs. Here below is a chart of the motif that I used/modified – the motif marked B. The next decision to make when using motifs to make a dress is to decide how many motifs you will use to fit around the body. Of course this also means you must decide where you will start the dress – at the top, over the bust, or below, at the hem? Or perhaps at the waist or hips? Whatever you decide, you should have a strategy for shaping. My strategy is simply using different hook sizes. I used cotton thread size 8 and 1mm crochet hook. 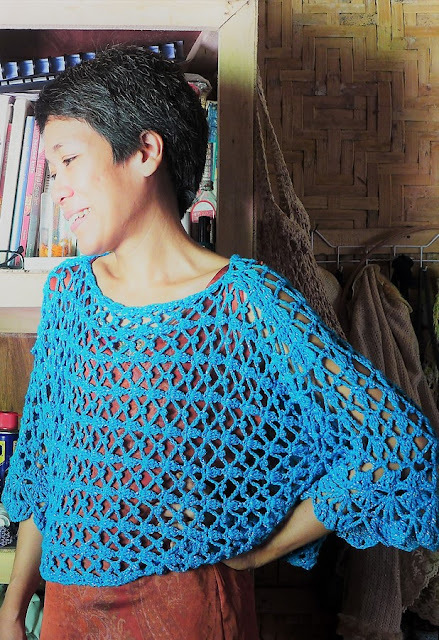 I started with motifs that go at the top, then I join the motifs to fit around my bust, not very tight, with 1-2 inches allowance. Do not make it too tight! Study your motif carefully – often it looks loose with one strip of motif, but when you add more motifs, it gets tighter. Also when you crochet the edging, the motif also gets tighter. If you want a larger bust dress with fitted waist, you will need to make a dress that has a zip at the back. When I get to the upper part of the hips, I change to a larger hook, 1.24mm, and when I get to the widest hip area, I change to 2.5mm hook, all the way down to the hem of the dress. For the straps, I made a chain using three strands of the cotton thread. 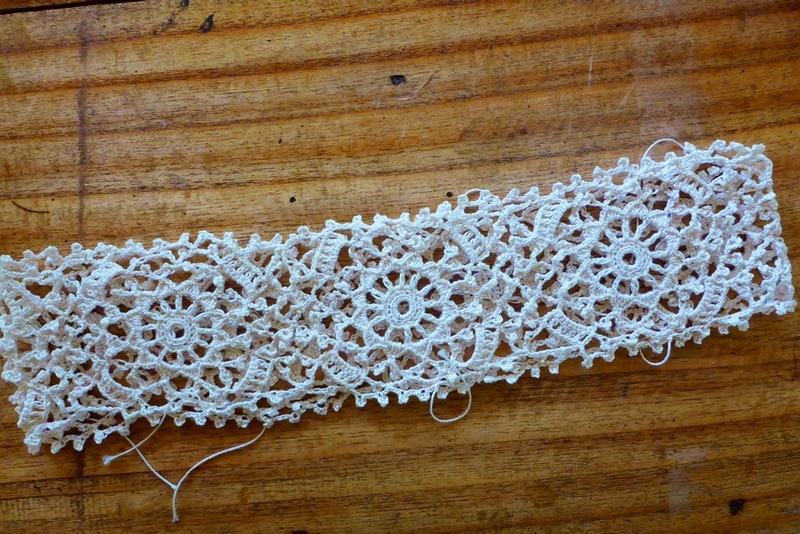 Here, the hem of the dress is worked in two rounds: first a round of 8-ch loops, then a sc-picot round. 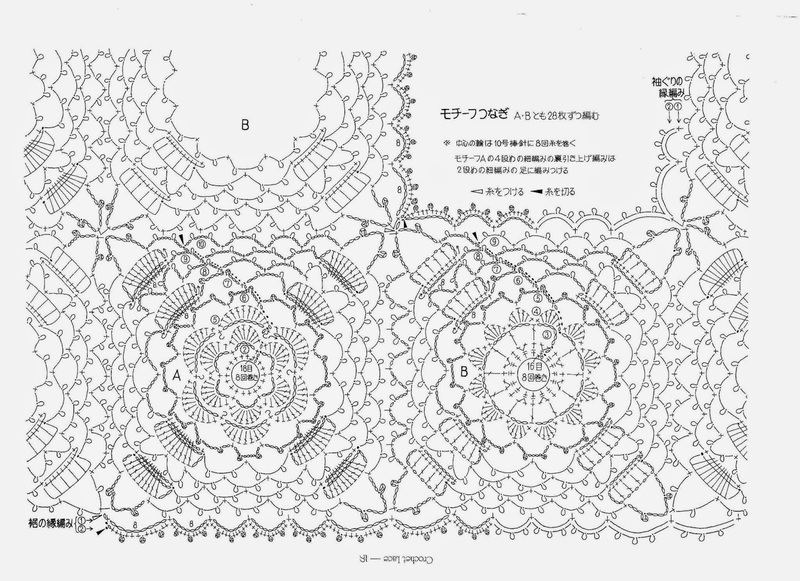 Refer to the crochet chart of the Bebe motif above for the pattern of the edging. 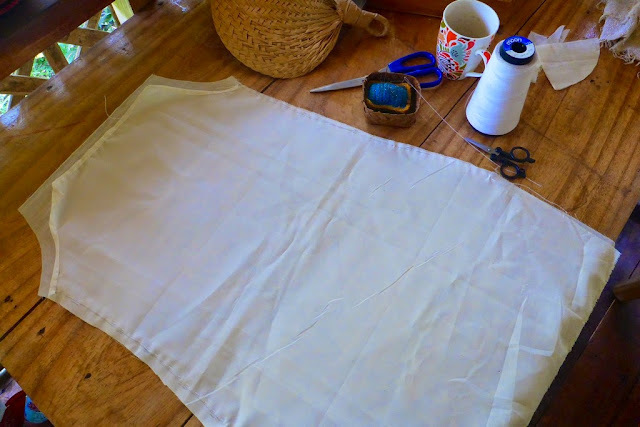 I also used this same edging for the neckline and armholes, with an extra 2 sc added for each loop for the hem of the dress so that the skirt flares out a little bit. I made a lining for the dress. This is the first time I have made a lining for a crocheted dress. I made the lining like I would make a dress that I would wear. When making a lining, I learned that I should not fall into the temptation of making the lining smaller than the dress. I sewed the lining to the dress by hand, as neatly as possible. This is my first attempt at a dress lining and it is not perfect. I would like to do this better next time. Then I sewed on these bra pads/cups, so that I don’t need to wear bra with this dress. It is not nice to wear bra with the straps showing. if I wear strapless bra it is very uncomfortable. Another strip of lining fabric should go over the pads here. Note that because I am an A cup (small bust size), I can put the dress on with the bra pads. 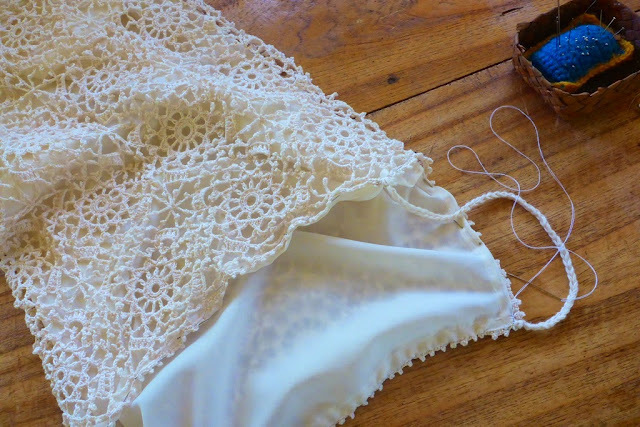 If you are a larger size and wish to sew bra pads to the dress, you will need to have a dress that has a zip at the back so that you can put it on easily. The finished dress! It is a formal dress. Unfortunately I don’t have anywhere formal to go to … not yet anyway. The back of the dress .. it is quite low and quite bare, so maybe I need to wear a shrug with this! Anyway, it is suitable for a formal occasion. 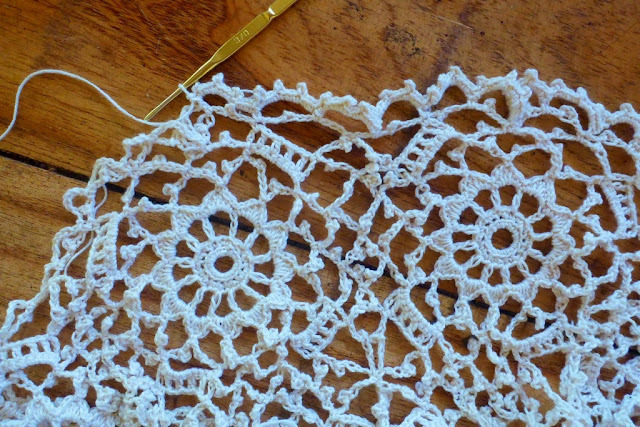 If you are interested in learning more about Bebe Irish Crochet, you can study the book “How to Make Bebe Irish Crochet Lace.” Happy crocheting!